ISO 45001 is now at the Final Draft International Standard (FDIS) stage, with the document used to start preparations for migration to the new standard. Based on International Labour Organization directives, ISO 45001 will replace the British standard, OHSAS 18001. 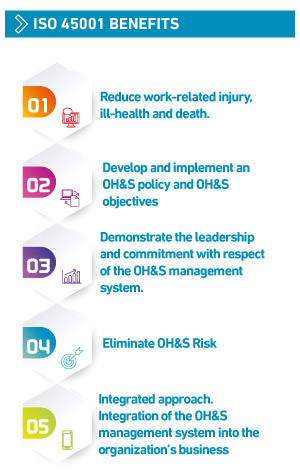 Implementing ISO 45001 is a strategic and operational decision for your company, enabling you to develop a comprehensive occupational health and safety policy, leading to fewer injuries and absences through illness. Drafting the ISO 45001 involved using a High-Level Structure approach. This comprehensive approach enabled full integration with other management systems, such as ISO 9001:2015 and ISO 14001:2015. Training courses. Gain an understanding of the new standard through courses developed by our experts. Online self-assessment tool. Identify areas for improvement, prioritize actions, and obtain a detailed overview of your management system capabilities using online self-assessment. Digital packs. We have designed a series of digital packs to ensure a smooth migration for your company in the simplest and most cost-effective way. Pre-Audits. A pre-audit is the best and most efficient way to check that your Management System is compliant with the new standard before we perform the Certification audit. Audits. Our audits provide you with the opportunity to validate the adaptation of your management system to the new ISO 45001 requisites. Bureau Veritas collects all the latest news about ISO 45001. Keep up to date via our Twitter and LinkedIn accounts. Please note that ISO 45001:2018 is a new standard; therefore the original certification dates relating to BS OHSAS 18001 cannot be shown on ISO 45001:2018 certificates as they would not be valid. Bureau Veritas Certification operates throughout the world, and has over 60 accreditations to provide national verification and accredited certification services. As a market leader worldwide, an extensive range of certifications and personalised auditing services are available in the fields of quality, health and safety, the environment, and social responsibility.